The following history is necessarily brief and incomplete due to circumstances. Thru research, it has been surmised that Hope Lodge came into being through an association of railway workers, many of whom may have worked for the now defunct Grand Trunk Railway. Some credence may be given to this assumption due to the fact that there exists several references in the minutes to rail workers. In fact, at the regular meeting held August 20th, 1907, a resolution was passed thanking the officers and members of the order of Railroad Conductors for the manner in which they carried out the funeral service of late Bro. William Hodgson. Another point of interest is that our present Lodge Seal shows a ship’s anchor, and one may be tempted to assume some nautical connection as well.Unfortunately our past records were destroyed by fire, and one can only rely upon conjecture; however, knowing the early history of the Town of Port Hope, one might well imagine these connections to the Brethren’s avocations to be true. 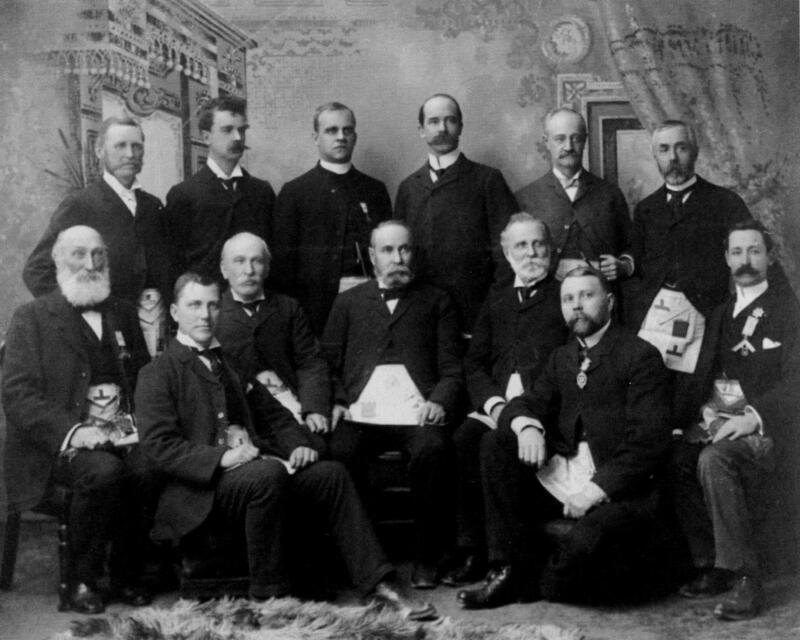 At a meeting of Master Masons to whom is granted a Dispensation by the Grand Lodge of Canada to open a new Lodge of Masons in Port Hope to be called “Hope Lodge of Free and Accepted Masons”, held in the Masonic Hall on Saturday evening, May 7th, 1859. In obedience to instructions received from the Deputy District Grand Master, Brother J.B. Hall, Worshipful Master of Ontario Lodge, summoned a meeting of Masons at the Masonic Hall in the Town of Port Hope, on Saturday the 14th day of May, 1859 for the purpose of installing the Worshipful Master of Hope Lodge claiming authority to work under dispensation from the Grand Lodge of Canada. On this date, Bro. Thomas Ridout became the 1st Master of Hope Lodge No. 114 on the Registry of the Grand Lodge of Canada in the Province of Ontario. W. Bro. Ridout then stated that the regular communications of Hope Lodge will be held on the first Thursday of every month at the hour of half past seven P.M. After arranging some local matters, Lodge was closed in harmony at 10 o’clock P.M.
As mentioned, the first Worshipful Master installed was Thomas Ridout whose name and service is honoured in Port Hope, by having one of the main streets named for him. The first treasurer was John Mulligan, who resided on Dorset Street, and was for a long time, the President and General Manager of the Midland Loan and Savings Company. Following them were such Masters as Lt. Col. Arthur T.H. Williams, or Riel Rebellion fame, whose monument stands now in our Town Hall Park, and J.G. Williams, a wealthy philanthropist, who resided on Bedford street. The Worshipful Master’s chair was filled by the above named during the first ten years of the life of Hope Lodge, and Mulligan continued as Treasurer until about 1872. In that year Bro. N. Hockin, who operated a dry goods store on the main street, appeared as Treasurer. He was succeeded in 1874 by Bro. Britton, and in 1876 Bro. Wilson took over. W. Bro. Adam Purslow succeeded him and continued in that capacity until 1889. W. Bro. Purslow was principal of the High School for many years. In this period the Master’s chair was filled by such men as John Wright, a coal merchant, Frank Gaudrie, C.W. Patterson, proprietor of Patterson’s Bank, Robert Nicholls, John Cheer, and W. Cothwaite, a Public School Principal. W. Bro. Frank Gaudrie took over the treasureship in 1889, during which period Edward Budge, proprietor of a Gents Tailoring establishment, George B. Salter, R. G. Blackman, who ran a hotel on Dorset Street East, in what is now a duplex dwelling, and Thomas H. Bell, who for many years after, was Grand Trunk Station Agent, and who, for many years after, was Hope Lodge’s efficient Secretary. Sometime during the year 1908 or 1909, a disastrous fire occurred at the north west corner of Walton and Ontario Streets in the Town of Port Hope. This building contained a large rug store within its ground floor and a set of offices on its second floor. But, this set of notes is particularly concerned with the third floor of the building, which contained the Lodge Rooms of the four Masonic Bodies of the Town. Owing to the loss of the minute books, the dates of the initiation of all these worthy Brethren are lost, but the history of the town of that time, was bound up in the community activities of these and many succeeding Masters, who served their Town and Lodge well and faithfully.